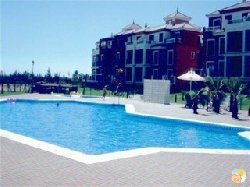 VILLAS AND APARTMENTS TO RENT IN ISLA CANELA, SPAIN. Welcome to our selection of holiday homes to rent in Isla Canela, Spain. Isla Canera is a small beautiful island with a Mediterranean climate located to the south of Ayamonte joined by a bridge. The main reason why tourists are likely to visit is of course the golden sand beaches, which are quite popular during the summer however those wishing to escape the crowds can usually find their own isolated beach to enjoy. You may also hire a boat from the various ports to explore the coastline. Water sports are also quite popular here such as deep sea diving, underwater fishing and sailing, as are outdoor sports such as trekking, mountain biking and playing golf. The restaurants consist of a mainly Mediterranean cuisine with fresh fish and seafood being popular dishes. Other restaurants have a varied choice including international cuisines. A traditional festivity in southern Spain is the Virgen del Carmen, a celebration for the patron saint of fishermen that is quite popular in Isla Canela and other nearby regions. Easter Week is also a popular festival as is the Juanillos burning in June. Looking for self catering holiday accommodation in Isla Canela? Then below is a selection of holiday apartments in Isla Canela and holiday villas in Isla Canela that can be rented direct from their owners. You can either click on each listing for further details or you can use our search engine on the left if you are looking for something in particular.